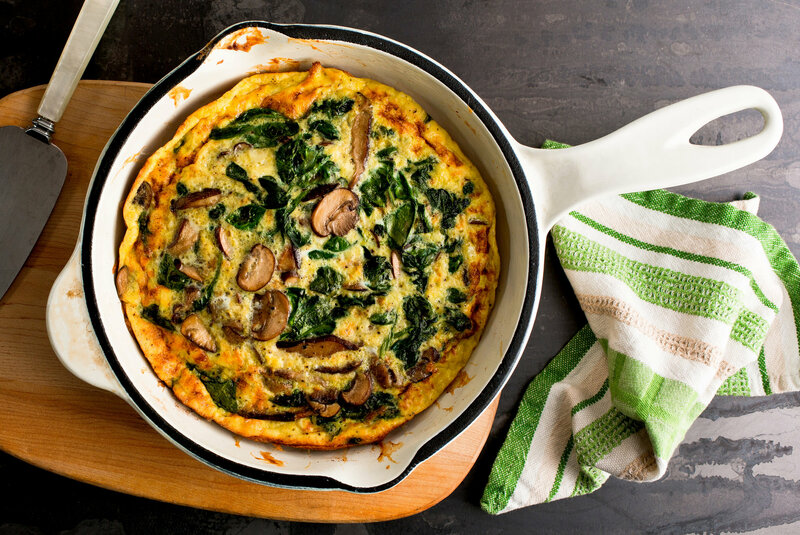 Place the spinach in the frying pan or skillet that you cooked the mushrooms in. Add a little water, 2 tablespoons more or less. Using medium heat, cook the spinach just until wilted, about 2-4 mins. Use either your hand or a spatula to pack in the spinach. Bring back the mushrooms to the skillet. You may season the vegetables lightly with salt and pepper at this point. Depending on the number of eggs you are using, create wells (if using 4 eggs, then 4 wells) in the middle by pushing the spinach and mushrooms to the side. Crack an egg on each well. Season the eggs with salt and pepper. Cook until the eggs are fully set or to your preference roughly 5-6 minutes.